Do you crave easy & quick keto recipes? If the family has been struggling to keep things healthy, this might be just the book you're looking for to keep the kids away from the sweets and junk food. 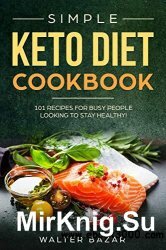 I focused on creating a unique Keto cookbook with 101 recipes that are fun and healthy for the entire family! These recipes are all you will ever need to stay on a Keto Diet! Go for it!